There hasn't been much crafting going on lately - I finally jotted down a nice long list of things to do before opening up an Etsy shop in May. It's something to shoot for, but I won't be too disappointed if it gets pushed back since there really is quite a bit to do! 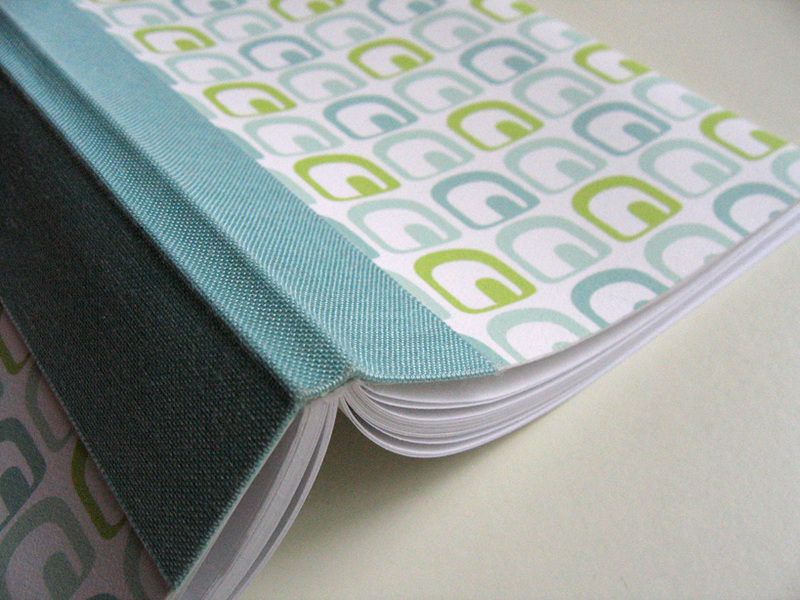 One of the main things is to finalize and refine the design and construction of these perfect-bound notebooks. I designed this pattern for the craft faire back in December, and it's sticking. Sometimes I think I have a keeper, but it'll fall to the bottom of the list as I come up with more new designs. The ones that continue to stand up against each new design become permanent keepers. It reminds me to keep on pressing ahead, even if I've come up with designs that I'm pleased with. Good designs must be put to the test! So I think this one is a keeper, but who knows? We'll see if it keeps on passing the test. oooo. looks great - can't wait for your etsy shop! Beautiful! I'm looking forward to your etsy shop too. 70's feel to it. At first I thought it was an elephant, then I thought I could see an igloo. It's a keeper!